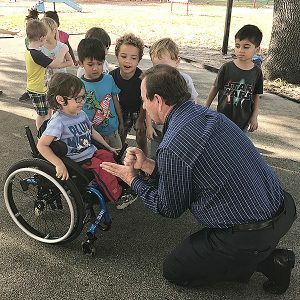 Make a difference in the life of a child with disabilities. Become a child sponsor by participating in our “Adopt-A-Child Program.” Easterseals Happiness House, together with Matt Buchanan of Sarasota Ford, is excited to offer you the opportunity to sponsor a child for an entire year for a gift of just $1,000. Donations can be received as one-time gifts or through monthly auto-payments of $100. Won’t you help us make a positive impact on the life of a very special child in our community? Easterseals Happiness House serves children, teens and adults with developmental disabilities including Autism, Down syndrome, spina bifida, cerebral palsy, and sensory processing disorders. In most cases, there is a gap between what insurance and/or Medicaid Waiver will cover and the actual cost of providing the services. We seek assistance from members of our community who will help us “mind the gap” so that no one falls through the cracks, losing essential and life-enriching programs and services due to lack of funding. This gap exists in each of our programs. For example, the outstanding cost for a child to attend the Lily School, our After-School Program or Summer Camp is $2,000 per year. That means we must raise $2,000 PER CHILD, per year, just to break even. Please consider donating to help us “mind the gap” in every department. 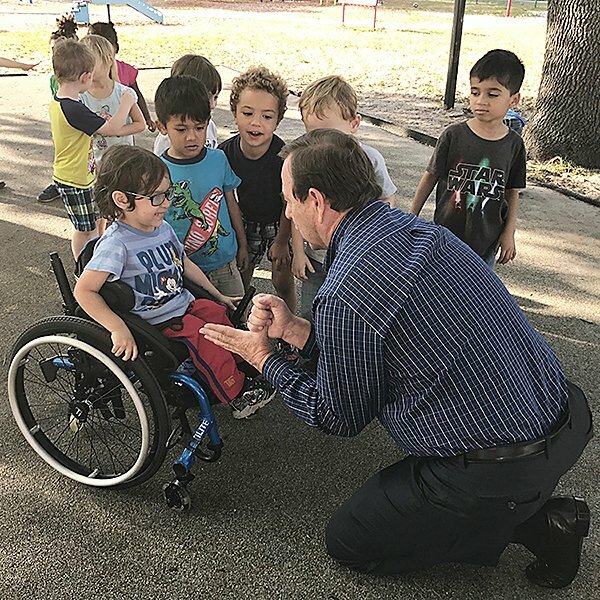 This family strengthening program has been providing a lifeline to parents of medically fragile and/or special needs children for many years. Each family has access to up to 16 hours of care for ALL their children – and even the pets! These parents do not have the luxury of calling the neighborhood sitter when they need to go to the doctor, a job interview or just go out for a date night without the help of our respite workers. 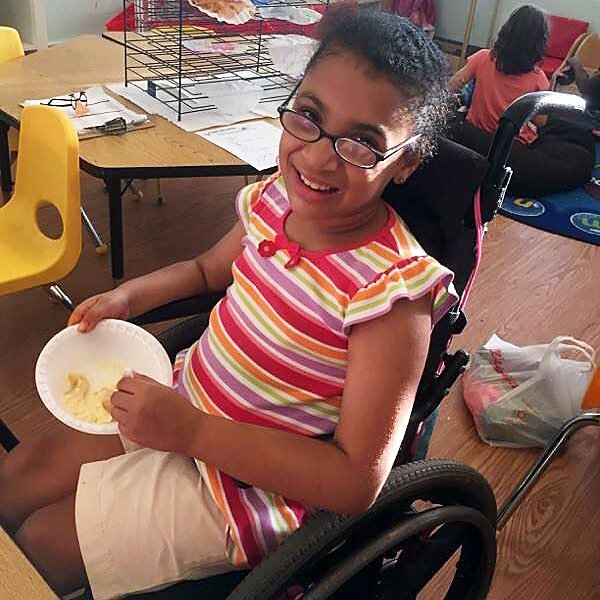 In addition to in-home care, we also provide a monthly “Kids Night Out” event where families can get some much-needed rest while their children enjoy themed, educational activities right here at Easterseals. We provide this monthly event with the help of our many treasured community partners such as Ringling Art School, Mote Marine Laboratories, LECOM, and Palmetto High’s FFA just to name a few. Our Art Initiative Program helps children and adults with disabilities to express themselves, while offering our adults the opportunity to generate income through the sale of their artwork. 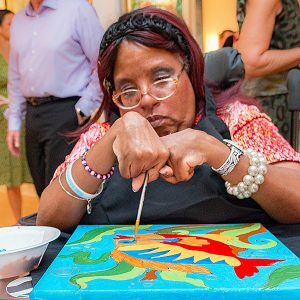 Our adult program is designed to help our artists develop artistic skills while setting them up for success. This is done by breaking down paintings and projects into small, easy to manage steps, and is achieved with careful supervision and patience. Our artists’ work is sold at local events and galleries, which allows them to earn 70% of the proceeds of each sale while 30% goes to help purchase art supplies. We are looking to expand our Art Program by offering a new ceramics program in the New Year and need additional funding to help keep this valuable program sustainable for many years to come.